Henkel Hysol® EA 9696 AERO film is part of a product line of moisture resistant, toughened, modified epoxy film adhesives. Designed for adhesive applications requiring both toughness and high service temperatures (up to 250°F/121°C), Hysol EA 9696 is available in various weights and thicknesses. 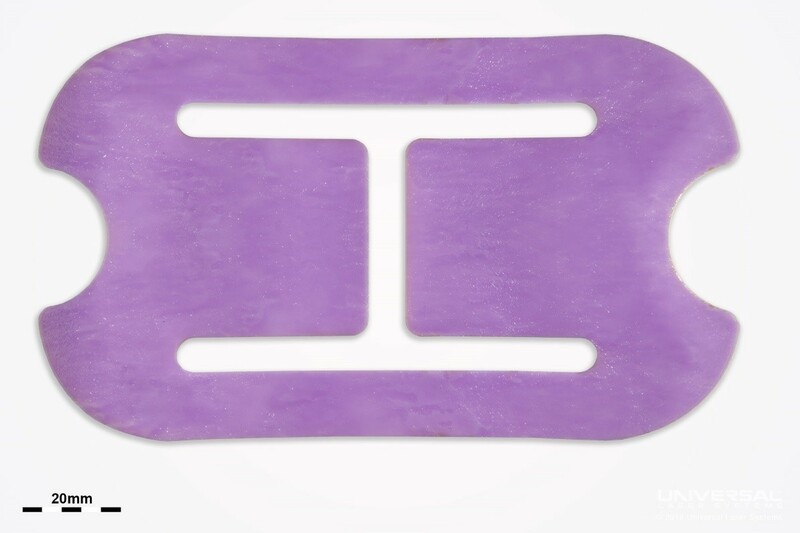 The Hysol EA 9696 .060 thickness chosen for this testing is 0.06 lb/ft2 (0.3 k/m2), consisting of a 320µm thick epoxy adhesive and a 125µm thick paper carrier. A diagram depicting Hysol EA 9696 .060 is shown in Figure 1. Figure 1. Hysol EA 9696 .060 diagram illustrating the epoxy adhesive (320µm) and the bottom paper carrier (125µm). Designed for structural bonds requiring toughness, Henkel Hysol EA 9696 .060 has excellent environmental resistance and the ability to cure at low temperatures. Commonly used for structural panels, Hysol EA 9696 .060 enables the use of a single adhesive for both honeycomb and metal-to-metal bonding applications. Hysol EA 9696 .060 is only suitable for laser cutting, in which the non-contact nature of laser processing enables applications with small features and fine geometry to be processed with virtually no material deformation or discoloration. This may be difficult to achieve with traditional mechanical methods. Other laser methods are not indicated, as they are not conducive to the intended use of Hysol EA 9696 .060. Universal Laser Systems® technology makes it possible to consistently and repeatedly process this material to a high degree of dimensional accuracy, with virtually no material deformation during processing. Henkel Hysol EA 9696 .060 was tested to assess laser processing compatibility and to determine the best configuration of laser peak power and wavelength. The epoxy adhesive layer in Hysol EA 9696 .060 absorbs the 9.3µm wavelength of CO2 laser energy more efficiently than other wavelengths available from ULS, enabling higher speed laser cutting with minimal discoloration. A microscopy image taken at 300x magnification of the edge of Henkel Hysol EA 9696 .060 after laser cutting is shown in Figure 2. 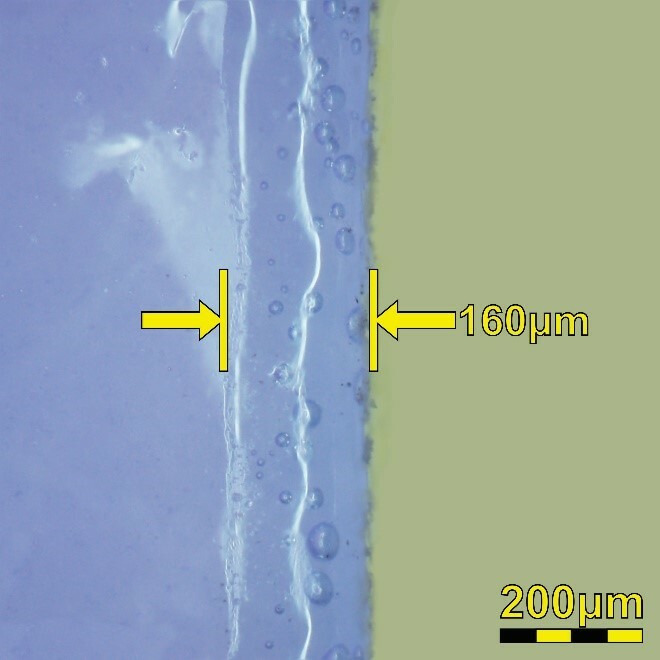 The 3D image in Figure 3 depicts how the epoxy adhesive layer responds to laser cutting with the system configuration of a single 75 watt 9.3µm CO2 laser source. Figure 2. Microscopy image (300x) depicts the edge of Hysol EA 9696 .060. The heat-affected zone measures 160µm. The pink adhesive layer appears to be blue due to the microscope’s lighting conditions. Figure 3. 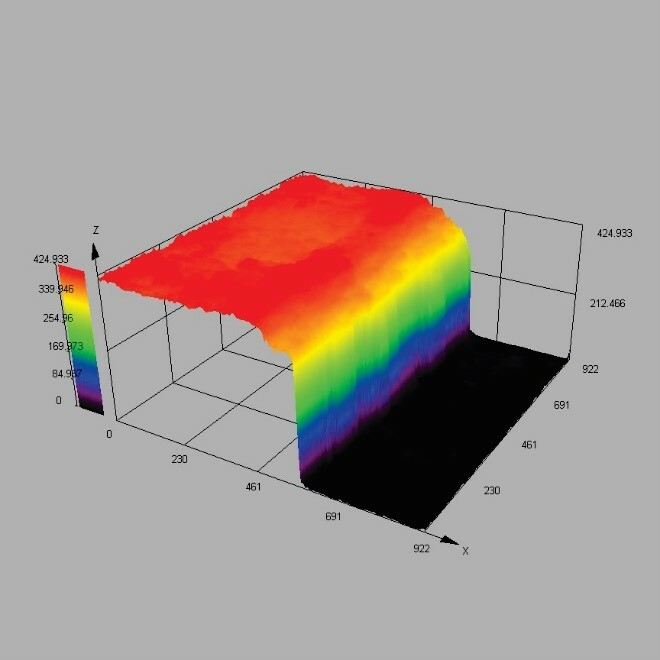 3D-rendered microscopy image (300x) of the edge of Hysol EA 9696 .060. Henkel Hysol EA 9696 .060 was also tested with the alternate system configuration of 10.6µm CO2 wavelength of laser energy. The results of these tests were compared by analyzing the heat effects, the edge quality, and post-processing requirements. The results of the comparison of these system configurations are listed in tabular form in Table 1 and shown photographically in Figure 4. Both system configurations appear viable with some slight differences in the resulting quality, as stated in the comparison below. Figure 4. 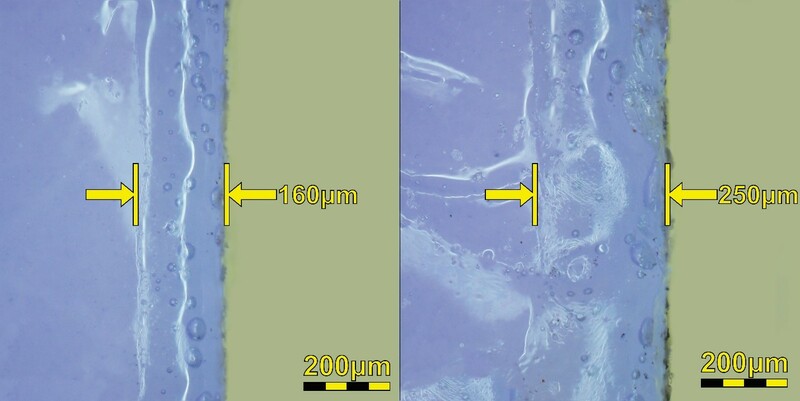 Microscopy images (300x) above illustrate the edge quality of Hysol EA 9696 .060 resulting from 9.3µm wavelength processing (left) and 10.6µm wavelength processing (right). Due to the lighting conditions of the microscope, the images of the pink adhesive layer appear blue. Henkel Hysol EA 9696 .060 applications requiring fine geometry and intricate detail with no degradation of the material’s physical properties can be achieved with ULS technology. An example demonstrating the results of laser cutting Hysol EA 9696 .060 using the recommended system configuration is shown in Figure 5. Figure 5. Example of the geometry possible when laser cutting Henkel Hysol EA 9696 .060. Henkel Hysol EA 9696 .060 AERO modified epoxy film adhesive is suitable for laser processing and was extensively tested to determine its optimal processing configuration. Through this testing it was determined that laser cutting is viable with this material and that using a 75 watt 9.3µm CO2 laser source is the best system configuration for optimal results. Hysol EA 9696 .060 efficiently absorbs the 9.3µm wavelength to produce an edge that has a minimal heat-affected zone and negligible discoloration. A 75 watt 10.6µm laser source is also capable of efficiently processing this material, but with a slight increase to the heat-affected zone.